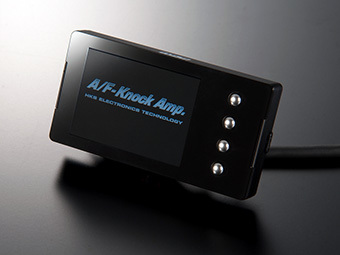 The 3rd generation of A/F Knock Amp, Air/fuel and knock monitoring functions in one package with an all new display style. High precision measurement of air/fuel ratio is possible with Bosch A/F sensor included in this product. Monitor knock through headphones to aid setup of fuelling/ignition with F-CON V Pro or a similar device. Knock level threshold can be set and shown in the display by setting knocking conditions. Two A/F sensors can be used together. (Bosch A/F sensor is included.) 1 main unit can measure 2 different A/F values of the V-bank engine or multi-cylinder engine using 2 sensors. 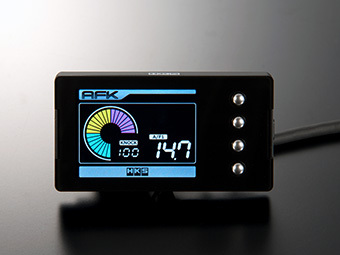 The product consists of 2 units, a color LCD display/controller and amplifier. The design style is consistent with other HKS electrical parts such as EVC, etc. Digital filter is implemented for knocking sensor signal process. This filter seperates other noises such as engine vibration for improved knock detection.